Victor Hugo speaks pretty good Japanese these days. He has a good story to tell as well, a different story from his own famous novels, poems and plays. In rue Scribe, close to the Opéra in central Paris he is the narrator of the “Paris Story.” In fourteen languages, he – or rather a computer generated Hugo – is the commentary for a multi-media history of the city, all the way back to the Romans. He is a good choice for the new media age, Hugo was a polymath; engagé too. A historian of the present, some say. He was, Wikipedia says, “novelist, playwright, essayist, visual artist, statesman, human rights campaigner, and perhaps the most influential exponent of the Romantic movement in France.” In later life he was a great “Republican”, in the days when that meant something quite different. When he published “Notre Dame de Paris”, aka, “The Hunchback of Notre Dame”, it was a pioneering social novel: spurred the nascent historical preservation movement in France and strongly encouraged the Gothic revival in architecture. Ultimately it helped to preserve Notre Dame Cathedral, where much of the story is based, in its contemporary state. It also boosted tourism to the capital, and led to the restoration of Notre Dame’s roof. So no De Sade for Ruskin then. His marriage failed on the wedding night because he saw his wife’s pubic hair – it is believed. “The collective memory of Western twenty-first century societies, and specifically of France, is imbued with the ideals Hugo professed. France has accepted, at least in part, the telling of memories that its ancestors did not want to hear. What Hugo achieved, at his best, was an “updating” of the past; going back and looking with new eyes in order to change the way a contemporary society perceived themselves, their country, and the way of things. Of course, Hugo brings with this vision his own demons, his own memories. But in certain key events, such as the siege of Paris in 1870, he was present as “history” changed. I don’t think we know Hugo in England nearly well enough. Sitting in the Grand Place in Montrueil its hard to think of social revolution, but that what his novel Les Misérables was all about. It was set here, largely, and is a novel of multiple plot and identities; what unifies all is the story of the ex-convict Jean Valjean, known in prison by his prisoner number, 24601. He becomes a force for good, but cannot escape his past, as they say in the movie traillers. By the time Hugo published the novel he was 60; but he had known success all his life. He was a literary prodigy:had a pension of 1,000 francs a year from Louis XVIII after his first volume of verse was published at 17. Before he was 35 he had written six plays, four volumes of verse, and the “The Hunchback of Notre Dame”. Anyway, years after the love-tyrst here with Juliette Drouet, in exile in Guernsey, Hugo wrote Les Miserables, and set much of the action here. It is a novel using fiction as a weapon against another out of touch Emperor. An emperor who would fall in 1870, after a disastrous campaign against the Prussians. Like Thomas Coryat, Hugo loved the classical poet Virgil. Peaks of the lines are lit with a mysterious glow. But what drove him on was a desire to change things. In the Place des Voges his house is now a museum, as with the Maison Jules Verne in Amiens, it is easy to understand the writer’s life here. Not so easy to understand why the museum is almost empty, when down the road the Café Hugo is overflowing. But it is a holiday. 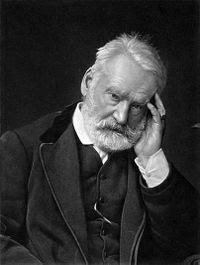 His first novel, in 1829, Le Dernier jour d’un condamné (Last Days of a Condemned Man) influences such writers as Albert Camus, Charles Dickens, and Fyodor Dostoevsky. Soon afterwards he wrote, Claude Gueux, a precursor of In Cold Blood: a documentary short story about a real-life murderer who had been executed in France, a precursor to his most famous work on social injustice, Les Misérables. As the computer generated Hugo takes us through the history of Paris, the idea of a socially committed novelist echoes; this haunting appears to have disappeared from twenty-first century life. What novelist changes things now? Answers please: but not the Code guy, please. How about Dave Eggers’ What Is The What? Haven’t read it yet, but from the looks of things it’s aiming in the social conscience direction in a bigish way.A number of crime novels come to mind, since a large subsection of the genre focuses on social injustice, though they’re bound to have little effect unless they break out of the mystery market, which few do. I think a lot of books take people to places, like Captain Corelli, or Vikram Seth, or early Rushdie. You know I think Bret Easton Ellis is a “social novelist” – the best satirist we have. Friends of mine tells me he means it. In Glamorama his “terrorist models” blew up the Ritz. Says something. I suppose what I’m getting at is that the agenda of “24” means more than most modern novels, perhaps the social has to be visual these days to get a message across. I don’t know, I’ve been reading old novels for too long, Les Mis and Voltaire and Sterne. That’s the problem with this journey, it forces you back into a past that can make the contemporary seem cheap and superficial. When we know that in many many places it isn’t. In a bookshop yesterday there was an entire table dedicated to popular sociology, everything from Aristotle (i know, i know) through some new book about the american crisis. Pristine and untouched of course.But published. What else, who else? Michael Moore? I think maybe we’re talking about book wherein the social conscience trumps, if necessary, the style or the visual action. Form serves the conscience entirely. That is hard to find these days outside Moore.Completely agree about Easton Ellis, though he too refuses to express his social outrage directly at the cost of storytelling, which gives his books an almost amoral sense to those not willing to look beneath the sheen. Yes, I think that is right. Conscience reads badly at the moment; and it is much easier to enjoy an older novel when we can see that things “improved” after its publication. I suppose as I flaneur around chic central Paris and name-drop Umberto Eco I’m hardly contributing, but now back in St.Denis, where around the corner from the shopping mall there are plenty of tough times going on for the young, often immigrant, kids – they wander late at night in small gangs, the police sit in vans in Victor Hugo square (irony 101), and France elects a hard-liner on immigration. There probably are novels about these issues being published now; it is a far stretch from Camus though. Social injustice has moved on to documentaries, I guess. Here it is mostly Grey’s Anatomy and Dr. House on the television. They screened Duras’ “L’Amant” – The Lover – on tv last night, the on screen ident said: “suitable for over 12”. It’s a steamy sort of film, I felt a little old and crusty, wondering if that was ok for 12 year olds. The hardest thing on the trip is feeling a pulse; I’m steeped in history, hearing its hauntings, and feel I am probably missing the point of the moment now.Hmm.